As I flew up the country from Wellington to Auckland this week, on yet another beautiful day, I was struck by the colour of our country. Brown. Burned to a crisp. The occasional smattering of green forest, but an island suffering from its worst drought in 70 years, as I’d heard climate scientist Jim Salinger saying on the radio that morning. Next I’m listening to Bill English saying farmers can’t expect get the same level of support in future droughts, if they continue to happen with more frequency, as NIWA tells us they will. Meanwhile John Key is in Brazil pleading with oil giant Petrobras to come back, and an industry-written report tells us we should drill all over the East Coast. It’s taken quite some time for the words “climate change” to enter the national conversation about this drought. I spoke with NIWA’s Brett Mullan last week and he had some very interesting points to make on the massive and very unusual highs that have been sitting over the country since early February. He’d make a great interview, I thought, but he said no media had called him to even ask. Climatologist Dr James Renwick wrote an excellent article in The Press, but it’s well away from those in the major drought area. Our agriculture-based economy is going to feel this pinch more than most in the decades to come. Indeed the Government is already signalling it may cause a return to recession. 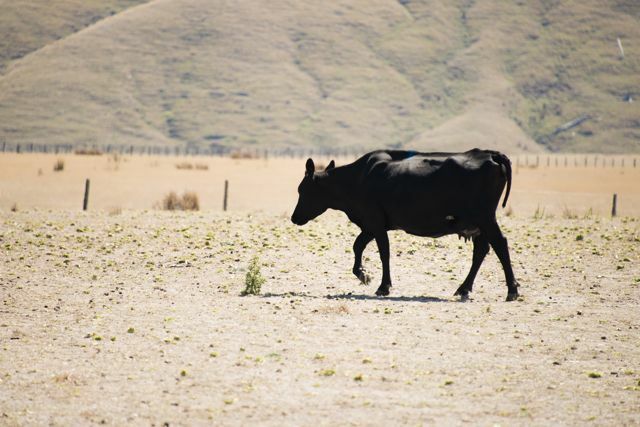 What worries me is that our agriculture is increasingly turning to intensive, water-hungry dairy farming, at a time when water scarcity is expected to rise. In 1981 there were 2.92 million dairy cows wandering our land. By 2010 this had grown to nearly six million. In the last few weeks we’ve seen farmer after dairy farmer on the news, having to dry off their herd early, buy in feed and sell cows off to the works as they can’t sustain them. There are so many ironies in this story that it’s difficult to know where to start. Federated Farmers and Fonterra fought tooth and nail to keep agriculture out of the Emissions Trading Scheme. You know, that thing that was supposed to be New Zealand’s response to climate change. Except it doesn’t, as our ETS is so weak it’s pretty much dead in the water. The ETS would, apparently, have been too costly for farmers. Because after all they have to deal with expensive things like – erm – dealing with drought. Of which there will be more, caused by – erm – climate change. Some of the extra feed they’re buying is palm kernel, palm kernel that comes from Indonesian plantations on land that used to house peatlands and old growth forest, activities that add a massive chunk of carbon to our atmosphere. So we don’t act on climate change, and we are now only OECD country to have no specific 2020 target to cut emissions. And our government is at the forefront of efforts to undermine progress at international climate talks. We’ve turned our backs on Kyoto, and we’re showing no signs of treating the need for a global climate agreement with the urgency the science is telling us it deserves, instead treating it like a set of trade talks. This is our worst drought in 70 years, but 2007/8 was almost as bad. Taking action to curb emissions, the government has argued, would cost the country, but did they factor in the cost of this drought, at $1 billion and ballooning, and the last drought that cost $2.8 billion? Meanwhile our dairy giant, Fonterra, wants to open a coal mine to operate its milk powder factories. Coal, that stuff that causes climate change. But we’re not allowed to argue climate change when coal extraction is being considered. Heaven forbid. Let’s hope the Supreme Court will listen to the West Coast Environment Network’s arguments this week as they battle Bathurst and Solid Energy in their bid to get the law changed. Of course I have sympathy for farmers at this terrible time. And of course I don’t blame all farmers for the state of the Government’s climate policy. We’re all in this climate change business together. From my own fast-emptying water tanks to the farmers (and associated industries) suffering across the country, we need to turn to a new way of thinking, a new way of operating in this climate-changing world. If I were a farmer I’d be screaming at the government to take leadership on all counts. Maps like this aren’t pretty. Our Government, for the sake of our farmers and all of our futures, needs to wake up, dump its short-term, fossil fuel-based thinking that holds up international action, and, indeed our economy. Instead of his myopic focus on coal mining, fracking, mining, offshore oil drilling – and indeed, carbon-intensive dairying, instead of kowtowing to the likes of Petrobras, John Key could be leading our country towards real prosperity. As a recent Greenpeace report has pointed out, we could be embracing a smart, clean, 21st century economy based on 100% renewable energy, energy efficiency and sustainable transport. All we need is some leadership. Otherwise we’ll all have to get used to this “new normal”. He missed the fact that Australia has just experienced its hottest summer in recorded history and its scientists say it’s down to climate change. Nice to have a Government so well-informed about the science. Apart from digging for coal, this Government is also building roads of National Significance. The most urgent is to convince the voters to toss out this Government and convince a new Government to act according to what is known to be the right way for our children’s future. How do we get the climate information and the information that inequality is not good for productivity and revenue gathering out there to the voters? (Joseph E. Stiglitz “The Price of Inequality”)????? As long as we (people) have a focus on business growth, and the government have a focus on business, we will not make any changes. We MUST change the government! We will be at or above 400 ppm for the next 1,000 years, the only way humans might ‘sequest’ carbon is via well buried coffins, having cadavers laying in the open will not do it. Rob, I do know that at least one New Zealand Company has now adopted the living wage of $18.40 and that this is a step in the right direction. I know that some families have to work at several jobs to make ends meet. When I first came to New Zealand from Denmark in 1976 this was a country where there was not such a big difference between rich and poor. Money spent on education will mean a better educated workforce and therefore more people in work and more revenue into the Government coffers. Likewise more money spent on universal health insurance through the tax system will keep our children and later workforce in good health and return what was spent initially. For these things to happen we need progressive tax rates. Good health and good education increases production efficiency. I also know that what money can buy does not make you any happier once you have the necessities of life like good shelter, food and meaningful work and live in a good caring community. Oh and by the way – don’t need a job – 71 and can cope on the pension and I hug my trees daily.